In this recap of the year’s healthcare happenings, For The Record zeroes in on four particular topics shouting for attention. It was a year of change in healthcare. Nowhere was that more evident than in the HIT industry, where seemingly every initiative had an effect on operations and planning. Rather than list all the happenings, this recap focuses on four trends and issues that bubbled a bit beneath the surface but nevertheless promise to have long-lasting ramifications. Are RECs Heading for a Wreck? Regional extension centers (RECs) were created under the HITECH Act in an effort to jump-start EHR adoption in small physician practices. As such, some RECs are creating preferred vendor lists. “There are currently 62 RECs across the United States. Most states have one; bigger states might have multiple. At this stage in development, some use a preferred vendor list, [while] others are planning to develop one, and there are also approximately 16 that state they will not have a preferred list,” says Jamie Stockton, CFA, an HIT research analyst for Morgan Keegan, a regional investment firm based in Memphis, Tenn.
“So far, if you look at the RECs that named a preferred list, they generally have five to six vendors on the list. Some have as few as two (Alaska); the biggest list is Massachusetts with 10,” says Stockton, who notes that the centers’ business models are diverse because their backgrounds are also diverse (institutions such as colleges, the Centers for Medicare & Medicaid Services [CMS] quality improvement organizations, and health information exchanges). According to an eHealth Initiative survey, among the factors RECs have considered during the selection process are ownership costs, meaningful use guarantees, the number of local installations, and the use of an application service provider-hosted model. During the first two years of operation, RECs are 90% government funded; however, that number reverses the following year. As a result, many centers are devising strategies focused on quickly getting the target number of physicians to achieve meaningful use. “Many want to have a preferred vendor list in place to streamline EHR adoption but have not gotten them in place yet,” Stockton says. Tate says it will be fascinating to see the services that RECs will be offering in a few years when the funding shifts from the government to the medical practices. Quality measures, EHR security audits, system customization, and interoperability support could be areas where RECs expand their services to medical practices. Experiencing this dynamic from both sides, Jonathan Bertman, MD, a family physician and founder of AmazingCharts.com, is wary of the process by which RECs are choosing preferred vendors and the message that the preferred list sends to physicians. According to Bertman, the federal government is spending $643 million to establish RECs in every state to assist healthcare providers in selecting a certified EHR system that offers the best value for the providers’ needs. However, he says the majority of RECs have interpreted this mandate as the authority to compile a short list of five to 10 “recommended” EHR products. ”Physicians are looking to RECs to guide them in their decision. Many physicians presume that the EHRs on these preferred vendor lists have received the stamp of approval of the federal government based on careful research and feedback from actual users, which just isn’t so,” says Bertman. In an effort to better understand the situation, Bertman contacted several RECs to ascertain who is involved in the decision-making process and how decisions are being made in regard to naming preferred vendors. Only one REC would disclose its process. It said four internal staff members were responsible for selecting the vendors based on the request-for-information questions. It would not disclose, however, who wrote those questions. Because RECs are funded by taxpayers, Bertman believes it is only reasonable and fair that the process be completely transparent and that decisions be made based on industry data. In addition, physicians need to be involved in the decision making since they will be the ones using the technology on a daily basis. “If not, you are basically saying that the government is selecting vendors they prefer,” he says. According to several media accounts, healthcare organizations are beginning to warm to the idea of using medical scribes, usually medical students who accompany physicians on rounds to help capture the clerical portion of a patient encounter. John Vowels, MD, scribe program director at Santa Barbara Cottage Hospital Emergency Department and co-owner of Emergency Medical Scribe Systems, says the number of vendors focusing on medical scribe programs is increasing incrementally each year. As for the impact of scribes on HIM departments, Vowels says physicians used to predominately dictate reports, so there was no niche for scribes. As HIM evolved and dictation began being sent to transcription to populate the chart, the scribe could help at times by transcribing a difficult lab report or medical chart when a doctor was busy. “Now with the adoption of the EHR, the reality is that the EHR can slow down physicians because now they type what they used to dictate. It is still point and click and you can do it at bedside without a scribe, but when trying to foremost treat the patient, it can be difficult,” says Vowels. The use of medical scribes, however, can improve not only the capture of critical care information but also HIM processes by having more complete and timely patient data. While many providers consider an electronic record to be a panacea for various inefficiencies, Weygandt says documentation during the transition can suffer. Scribes help physicians treat the patient rather than “treating” the computer, says Vowels, who notes that some patients worry that the use of scribes will create larger medical charges, but the reality is that physicians can only bill to the level of complexity that the presenting complaint deserves. Weygandt says scribes can allow physicians to focus more on patients and less on data entry while helping capture more accurate details of the encounter. However, he notes, scribes are more apt to make documentation errors involving orders or procedures. Scribes are having an effect in one particular area of the hospital, according to Weygandt. “Scribes appear to be making a significant impact in emergency departments, where delayed documentation often results in loss of accuracy, failure to capture all procedures performed, and incomplete medical records,” he says. New rules enacted through the HITECH Act have bolstered HIPAA guidelines and promoted stronger enforcement of its privacy and security regulations, making healthcare organizations take a closer look at how they account for and disclose protected health information (PHI). 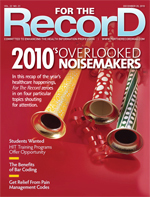 Don Hardwick, director of compliance and field operations at MRO Corp, says the stricter regulations affect the release of information twofold: the technical capture of information being disclosed and the consistency in following required HIPAA guidelines for properly disclosing PHI in all departments. “I don’t know that hospitals have gotten their arms around all the areas that make disclosures or if those locations are following the same guidelines of proper disclosure as traditionally performed in the HIM department in order to be in compliance with new regulations,” he says. The accounting of disclosures promises to be challenging for most providers, Hardwick says. “You have to be able to provide an accounting of all disclosures made by a healthcare entity at the request of a patient. As the public becomes more aware of its right to ask for such an accounting, the result may have a huge impact on a hospital’s manpower. How the facility accounts for who requested information, where and when the information went to regarding which treatments, and what information was provided is something they all need to address throughout the enterprise,” he says. Because PHI can be disclosed at many locations inside a facility, another concern is how a disclosure is made. Facilities have been following the traditional HIPAA guidelines for release in the HIM department, but hospitals have many disclosure holes from point-of-service areas such as the emergency department and nursing stations that fall outside HIPAA parameters. “It seems benign at the time, but there are certain steps that need to be taken in order to prevent a breach violation or improper disclosure,” says Hardwick. To be compliant, Hardwick says facilities must locate leaking points, identify the types of leaks, and put policies in place that promote proper methods of disclosing information. The end state may remain the same, but the disclosure process must follow the proper guidelines. Jared Rhoads, senior research analyst at CSC Global Healthcare, says the new rules are heavy on maintaining proper documentation. “For example, with the definition of business associate being expanded, going forward, organizations must ensure that policies for protecting PHI are encoded in contracts with business associates and that they are in compliance with HIPAA because in the past they were not explicitly included as covered entities,” he says. Data breach notifications are also an issue that healthcare organizations must properly address. “There are different levels of notification based on the magnitude of a breach,” says Rhoads. For example, with a breach affecting more than 500 individuals, the facility must notify the media in addition to Health and Human Services. Linda Ricca, a client partner at CSC Global Healthcare, notes that some organizations are creating a role for breach “notification coaches” who can help guide a facility as to how to best notify patients of breaches while still following guidelines. “Most importantly, they have to keep a view of the primary goal of taking care of patients and manage the notification impact to patients so the notifications are handled with concern for patients’ overall well-being,” she says. Ricca says organizations are beginning to take a proactive approach, monitoring how data are stored, what kind of information is shared, and whether the information is properly encrypted and shared. “Facilities are looking at various technologies to see where breaches occur, from within which departments, and even down to the employee level. This way, education can take place to ensure employees are carrying out business practices that support information security,” she says. Education and reeducation, Ricca says, are becoming staples of security strategy. Many providers are teaching employees across the organization about how to enable the proper dissemination of PHI so it becomes an integral part of providing quality patient care. “With the enhanced penalties, both civil and monetary, the stakes are raised,” says Rhoads. “Organizations are taking information security seriously while continuing to adhere to the goal of high-quality, safe patient care,” adds Ricca. Another ruling that falls under the HITECH Act currently states that multicampus hospitals sharing the same Medicare provider number will receive only one payment for meeting meaningful use requirements, essentially treating them as if they were only one hospital. Therefore, multicampus hospital systems are losing out on substantial government funding to help them implement HIT. The ruling is being challenged by several industry organizations, including the American Hospital Association. The situation was uncovered shortly after the bill was passed. “We first waited to see if CMS would fix the problem, but it didn’t because CMS didn’t feel it legally could so they kicked it over to Congress. But it is always difficult to do anything before an election, so we are currently stuck and doing everything we can to get this changed,” he says. In response to the ruling, many hospitals are considering applying for a separate Medicare provider number, but that can be a long process. In addition, Childs says there are reasons multicampus hospital systems have a single provider number, namely for administrative and financial efficiencies. Either way, it is a waiting game. — Annie Macios is a freelance medical writer currently based in Calgary, Alberta, Canada.